Contrary to how much cured pork is on this blog, our meals are often light on meaty things. Bacon and its relatives do happen to show up in special dishes though, and this pizza, it is super special. The Recipe Redux folks asked us to share a healthy pizza recipe that we can all look forward to after a long week…or a long day. This gluten and dairy-free pizza is definitely worth coming home to. Two years ago, I eliminated gluten. It was not as rough of transition as I had anticipated, except for pizza. Pizza has always been among my top three favorite foods, and W can eat it at least twice per week, indefinitely. We had an amazing pizza crust recipe, one that we had trialed and tailored so many times that it was loved more than any other pizza crust at even our favorite restaurants. It just so happens to contain a lot of wheat flour. When I received those test results back in January of 2012, and had cleaned out the cupboards and brought in new gluten-free flours, I quickly set to trying an array of pizza crust recipes. None of them were even remotely appetizing. They were difficult to roll, sticky, crunchy, and tasted like crackers. There was none of that bready texture that we wanted. Worse, we couldn’t find a better crust at any restaurant, even ones claiming to have an amazing gluten-free option! Then came months of still not feeling well, and the frustrating news that dairy was a culprit too. Feeling defeated, I gave up on pizza for a while. No longer. A few more months of experimentation paid off. We ate a lot of bad pizza in the process, but finally created the crust. And cheese? We have come to realize that when good toppings are loaded on, the cheese isn’t missed. Now let’s talk about these toppings. 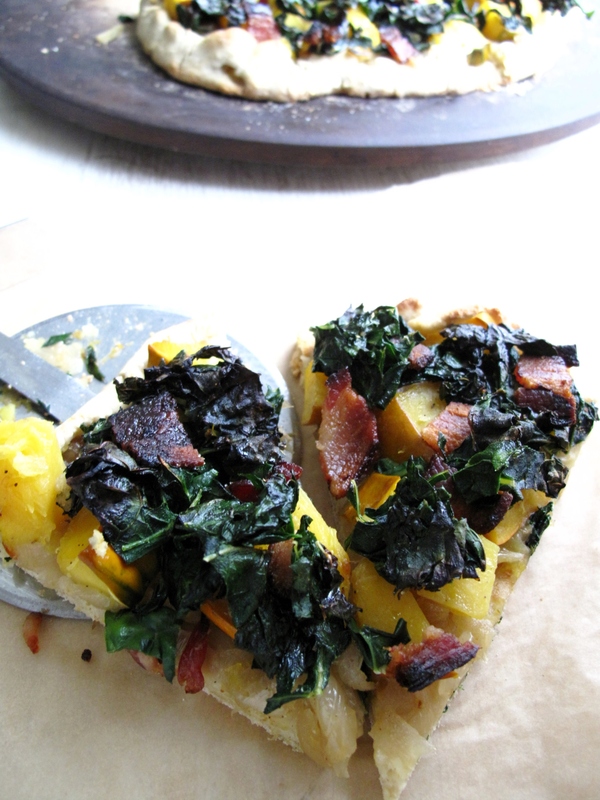 This pizza involves acorn squash, lacinato kale, caramelized onions, honey, and a touch of bacon. It’s one of my favorite combinations. 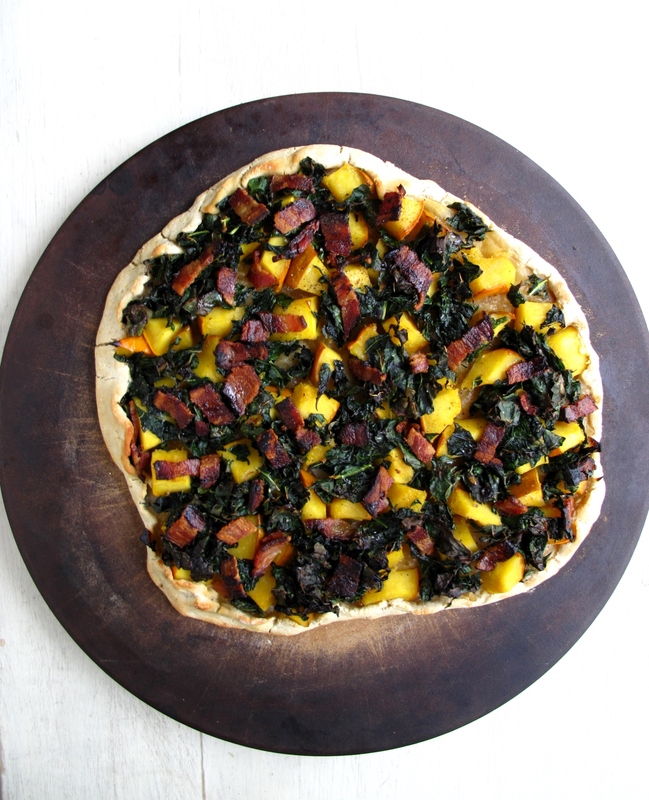 The caramelized onion forms an exquisite base in lieu of sauce, and with the slightly salty kale, squash and bacon, and with that drizzle of honey, the combination of sweet and salty creates a pizza that leaves us no longer missing the gluten and cheese. A note about the crust: The ingredients below make enough for two 10-12″ crusts. Each pizza usually serves two to three. You can refrigerate the dough for the second crust up to two days. Due to the differences in the flours, I like to weigh them with a kitchen scale to get an accurate ratio of 70 percent whole grains and 30 percent starches. I’ve then put those weights into cups so it will be easier to measure without a scale, but if in doubt, I’d use a “short measurement,” rather than an overflowing cup. In a large saute pan, pour in olive oil and heat to medium high. Add onions and allow to cook until they are becoming soft. Add a good pinch of salt and turn down to medium, covered. Stir occasionally and turn down again, if they are cooking too high. They will take 30-45 minutes to become golden and soft, and caramelized. Remove from pan and set aside. In the same pan as the onion was cooked in, add a small drizzle of olive oil and pour in the chopped kale. Add a good pinch of salt and cook just until slightly wilted. Remove from pan and set aside. In the same pan as the onion and kale, add 1 Tbs. olive oil and squash. Cook over medium heat, just until the squash begins to soften slightly. Remove them from the pan and set aside. 1.Combine flax seeds and 3 tablespoons very hot water in a small bowl until a slurry is formed; set aside. 2. Combine flour and salt in a large mixing bowl or bowl of a stand mixer. Combine yeast, 1 Tbs. olive oil, sugar and 1/2 cup warm water in a medium bowl or measuring cup. Allow to rest for 3 minutes for yeast to activate. Add yeast mixture to flour mixture; mix for 1 minute. Add flax seed slurry to the dough and a portion of the remaining water; mix until the dough comes together in a ball. If it is too dry, add enough water to for a tender, pliable dough. Set aside to rest for 1 hour. 3. Preheat oven to 450 degrees F. Separate the dough into two equal portions. Sprinkle your pizza stone or baking sheet with a light sprinkling of cornmeal. Roll one of the dough portions out to desired thickness directly on a pizza stone or baking sheet. 4. 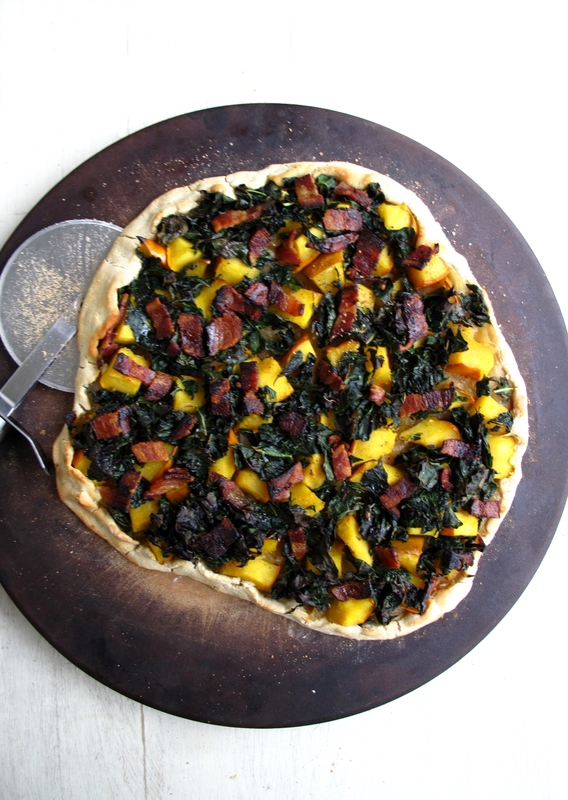 Sprinkle the dough evenly with caramelized onion, followed by squash, then kale, bacon, and finish with a good drizzle of honey. Fold the crust edges in when done. Bake for about 16 minutes. Simple and gorgeous – delicious pizza! 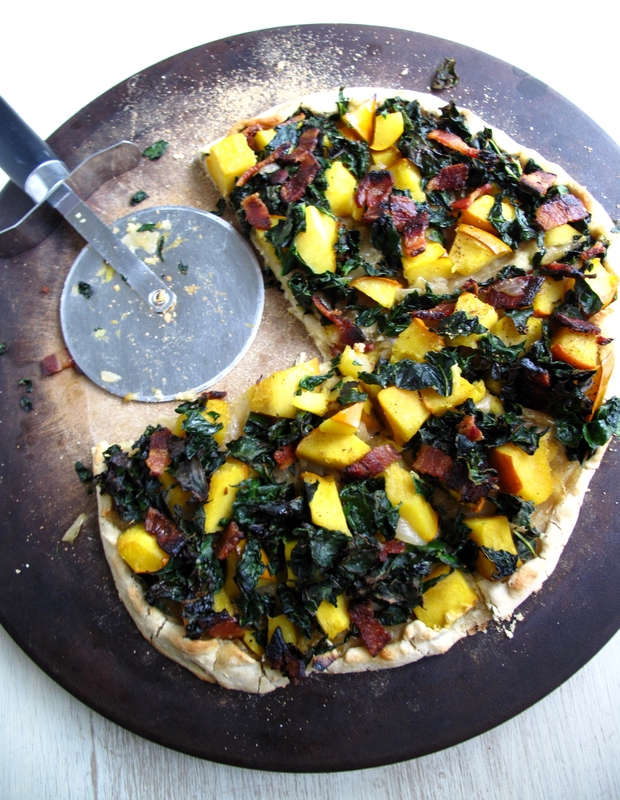 I always throw butternut squash on my pizzas, but acorn squash looks to work just as well! I’m going to have to try this for my next pizza combo! Thanks for sharing your frustrations with other gluten-free pizza doughs. Will have to give this one a try.